This interactive presentation contains the latest oil & gas production data from 13,324 horizontal wells in the Permian (Texas & New Mexico) that started producing since 2009/2010, through October 2017. With output rising fast in Q3 2017, the Permian basin became the largest source of unconventional horizontal oil production in history, surpassing the previous high in the Eagle Ford early 2015. In October, total oil production (horizontal wells only) amounted to 1.7 million bo/d, before revisions. Amazingly, half of this came from wells that started in 2017, as you can see from the pink colored area above. In the “Well quality” tab, the production profiles for all these wells are shown. Average well performance improved significantly from 2013 to 2016, and was again slightly better in 2017. To find out which operators had the best wells in a certain period, the 4th tab (‘Productivity ranking’) is useful. For example, by changing the period from 24 to 12 months, and setting the ‘Year of first flow’ to include only 2015 & 2016 wells, you will get a ranking of all operators based on the average first year cumulative production for the wells that started in these years. Going through the list, you’ll note that of the large operators (>100 wells), EOG, Cimarex, and Pioneer Natural Resources, had the best performance according to this metric. I expect that by Saturday I will have a new post on the Eagle Ford. Production data is subject to revisions. 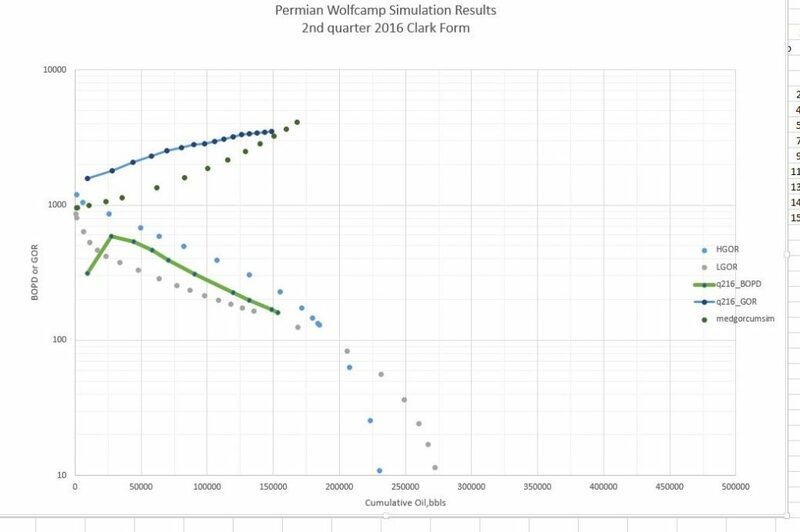 Reference is made to a 2014 AAPG paper from Apache which presented the results of reservoir simulations for a 7,000 horizontal wolfcamp horizontal well frac’ed basically 100 times. The modelled reservoir was basically 70′ thick and the drainage area about 100 acres. The reservoir had 1 microdarcy of permeability. The purpose of the simulation was to illustrate the anticipated oil recovery schedules for Low, Medium and High GOR cases. Presented in the “Clarke Format” showing both daily oil production and GOR behavior versus cumulative oil are the results of the High and Low GOR simulation in dots, with the actual 2nd quarter 2016 average Permian behavior from shaleprofile.com in solid lines. The High and Low GOR simulation cases appear to do an excellent job of bracketing AVERAGE historical well performance. These simulations would result in an average oil recovery of around 250,000 barrels at 10 BOPD. It appears groups of double doubles (wells that cross 200,000 barrels of recovery at over 200 BOPD) occupy rarified air in the noncon space. EOGs 2008 Bakken wells are in this elite subset. In the Eaglefords best year (2014) DVNs Dewitt county wells found themselves there- and they are in the top 5% of all wells that year. Now, PXDs 2q 2016 Permian wells have entered this bracket, and are in the top 10% of Permian wells completed that quarter. I thought Graphs of Rate versus cumulative recovery and GOR behavior of these three would be interesting. How much does early time behavior mean for great wells and what are the factors that influence later behavior? If the DVN Dewitt wells go on to EUR 300 MBO, they recovered half their EUR in 9 MONTHS. Are you saying the production has to fall off cliff to arrest the EUR at 300BO for PXD wells in Midland according to Apache 2014 AAPG paper? BTW, do you have a link to that paper? Happen to be working on the EUR estimate from the shale reservoir’s SRV, TOC and pressure lately. If according to your estimate volume, 100 acre drainage area by 70 ft depth, and assuming 5% porosity, we are looking at Original Oil in Place (OOIP) at 32MMBOE. If according to Apache’s 2014 simulation, only 300MBO along with 200MBOE of gas is recovered, we are only looking at recovery of 1.5%. With 500MBO and 300MBOE of gas, it is still only 2.5% recovery. This number might be too low based on this simple “SRV*Porosity model”. You might consider downspacing by a factor of 2 or 3. 7758*100*70*.05= 2.715 MMbbls Pore Volume? It doesnt have to fall off a cliff it just has to go exponential. Look at DVN Eagleford. I appreciate the thoughtful response. 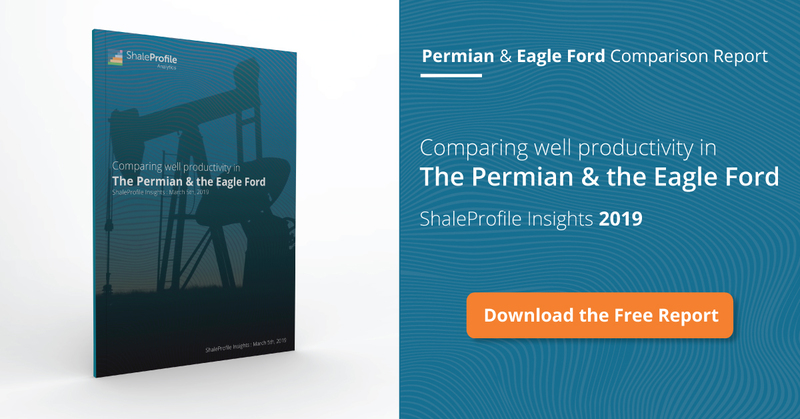 I would like to note that experience and analysis in the Eagle Ford and Bakken would support the view that most of the rock is being stimulated with modern completions. This view is supported by RTA, simulation history match, and achieved recovery factors. Ancillary methods such as microseismic, coring, and production logging also support this view. I do not know how familiar you are with evolving completion techniques in these plays, but going back 3 to 5 years, two trends are increasingly employed with positive effect, namely, diversion products – both near wellbore and far field, and the recent implementation of 200/400 mesh ceramics, referred to as Microproppants. The near wellbore diverters are said to increase perf effectiveness from the 65% range to near 100%. Far field diverters inhibit the unwanted spread of the frac which are routinely monitored by microseismic. The created, hydraulically induced fissures are frequently too small for 1o0 mesh. The much smaller micro proppants can enter, scour, and enable 100 mesh to position and prop. This greatly enhanced complexity, taking place in a somewhat controlled manner, is where all the huge amounts of sand are going. The former CEO of Core Labs estimated that only 1/10th of each lateral’s projected reservoir volume is currently being stimulated and propped. He made another interesting observation in that there would be a flattening of the tail production profiles as the microscopically small fissures in a more highly stimulated reservoir would provide a longer distance for the liquids to travel over time. Correction for my piece above. I believe that PXD is at 6-wells per section (880 spacing), not my stated 990 spacing. 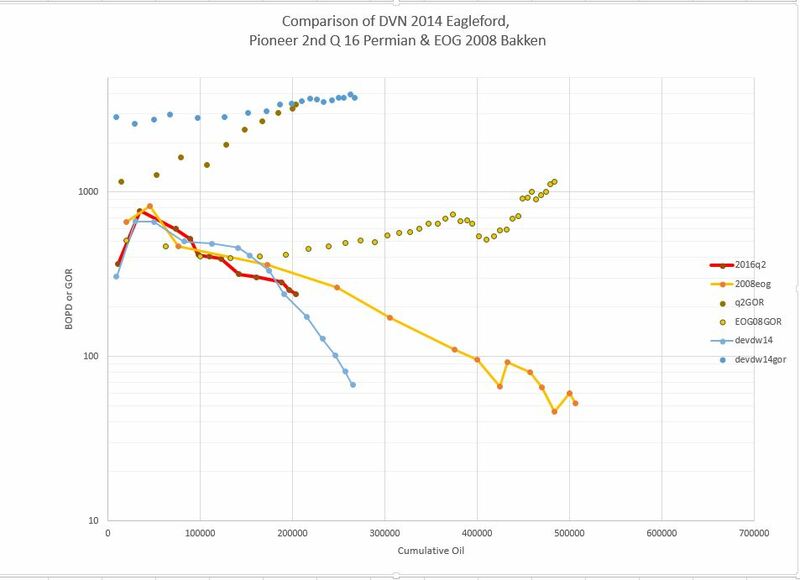 Achieved RFs in the Bakken and Eagle Ford core (areas which are now mostly fully developed) are actually trending quite high (note the thin “h”), much higher than I would have expected a few years ago. Either the plays are accessing more rock (i.e. stealing from the Austin Chalk or Three Forks) or the pore structure is conducive to high primary recovery factors…. probably some combination. From a physics standpoint, I see no issue why stimulated unconventional rock would experience lower RFs than conventional reservoirs (under primary recovery). Although, yes, it will certainly take longer. In fact, the physics may support higher theoretical primary recovery in an unconventional “shale”. This is driven by capillary pressure and associated relative permeability (water is preferentially retained, higher critical gas saturation, greater rel-perm curvature, possible other macroscopic changes to “bubble point” in-situ). I would highlight that assumed Permian spacing currently is at 660ft (per bench) and often more coarse. Most 1MMBOE curves are for 7500ft or 10000ft laterals which would require 120 or 160 acres (at 660ft spacing). Also note that many operators use theoretical S&Y to calculate their 1MMBOE volumes. You’d be looking at somewhere around 650MBO EUR for a 1MMBOE curve. Wells are usually being landed 200-300ft+ from their vertical offsets and communication is usually pretty apparent between such wells (not a necessarily bad thing, indicates the rock is being stimulated). This is consistent with broader industry trends that fracs usually have pretty good vertical growth. It also aligns with the old school 3/1 ratio – which would imply that for a frac half length of 400ft (times 2 for both wings) you would have a vertical growth of 270ft. With these clarifying items, you’re looking at a per-well implied OOIP of 5-7.5MMBO and an implied RF of 9-13%. Now this assumes you contact all of the rock. Back off and say that you only contact 2/3 to 1/2 and the implied RFs get high but are still in line with the technical limits indicated by simulation (the Apache paper placed RF in the SRV at ~25%). Also, keep in mind that you’re using an aggressive stimulation strategy (660ft spacing, hopefully stress shadowing) and likely also benefit from some conventional aspects of the layered Permian facies. Also keep in mind that the higher type curves from PXD and others (1.1-1.7MMBOE) are usually also associated with greater well spacing. PXD is mostly drilling to 990ft spacing at this point. You may not think the recovery should be that high etc. But the model is what it is. I cannot iterate on a 10,000 X 10,000 block heptadiagonal Jacobi matrix through the bubble point tracking routine in my head. So I rely on what the simulator says for what I think is possible. It’s like my first boss at the major oil company told me- we’ve had a lotta good young engineers come through here, but I haven’t had one yet who could fit down even a 1,000′ well to see what’s going on. Interesting concepts on TOC and liquid hydrocarbon generation. Not in my wheelhouse or the outhouse of my wheelhouse. But I guess the assumption is that these liquid hydrocarbons have not migrated, they are where the good lord or greyhound put them. Have to be to make it a control volume constraint Id say. Sorry that I made a mistake in the number of acres by putting an extra zero! I agree that it is hard to imagine the EUR could ever reach 1MMBOE whatever way with only 2.7MMbbls pore volume, implicating more than 35% recovery with fracking only! The SRV or drainage area should be 50%~100% larger, to give a more reasonable 10~20% recovery. On the other limit, the TOCs of Wolfcamp is usually only 5% (by weight) or much less, and if we use this number, along with 100 acre by 70ft SRV, or total of we are talking about each gram of TOC needs to generate over 0.4ml of liquid Hydrocarbons in order to fill the 5% porosity. Such numbers are quite exotic for organic geochemistry, where usually each gram of TOC could only generate up to 0.3ml of liquid Hydrocarbons. I have a question on bigger fracs. Does it front load a well? What I mean by that is month 18 through end of life won’t produces as much oil and gas? My prediction- the day you click your link to this website and find out it has disappeared- you will have your answer. And my prediction is that will happen much sooner than most folks think. About PXD’s 2016 Wolfcamp (the main play) wells… I noticed that the GORs started at slightly lower levels but are rising much faster than with earlier well vintages. According to the simulation referenced above, the originally low but rapidly rising GOR means rapidly depleting well. On the other hand, it is hard to find examples where Permian production has “fallen off cliff”. water, especially uncontrolled reservoir water attack close to the oil/gas pocket is always the biggest threat to oil and gas production — it is so for conventional oil and gas and more so for tight/shale resources. Don’t expect tight rocks will use water to drive out oil and gas like conventional reservoirs, for those water drive to work with conventional reservoirs, the pore throat should be uniform. The oil left in the sub-micron pores will not be get out by water flooding. The micropores in tight/shale reservoir rocks will have much larger capillary pressure for water than oil and gas. It will just seal off the sub-micron throat for good, and take over the large flow channels — you will only get water in the large channels. Even Saudi’s largest carbonate oil reservoir, the Ghwar, has lots of oil in the micron pores, and they can not use water to drive them out — they still stay underground. For unconventional oil and gas, the worst nightmare case of water flooding is the Miss Lime. Once the water starts pouring out, GOR shoots up, and oil first nose dive and then gas. Then cost of water services will destroy the wells and rock the earth like in OK. The EOR work being done by North Dakota’s EERC group has found that ethane may be the most effective medium to recover remaining oil in the Bakken. Steven Hawthorne has a few good presentations online showing the results of their lab work that has produced exceptionally high oil mobility from upper, middle, and lower Bakken bench samples.